Ballet West • A beautiful silk cape and cross-dressing farcical, not slapstick, stepsisters are just a few of the changes that mark Frederick Ashton's "Cinderella." Ballet West dancers Christopher Ruud and Easton Smith as the stepsisters in Sir Frederick Ashton's "Cinderella." (Courtesy Erik Ostling) Ballet West first soloist Arolyn Williams as Cinderella, with principal artist Christopher Ruud and soloist Easton Smith, as cross-dressing stepsisters in Sir Frederick Ashton's "Cinderella." (Courtesy Erik Ostling) Ballet West first soloist Arolyn Williams in Sir Frederick Ashton's "Cinderella." (Courtesy Erik Ostling) Ballet West first soloists Arolyn Williams and Haley Henderson Smith in Sir Frederick Ashton's "Cinderella." (Courtesy Erik Ostling) Francisco Kjolseth | The Salt Lake Tribune Ballet West dancer Arolyn Williams, who performs as one of three lead dancers in Ballet West's revamped "Cinderella," which opens on Thursday, Feb. 14. "If the shoe fits" is a phrase so embedded in popular culture it rarely needs completing. And the sympathetic fairy-tale character of Cinderella is a universal analogy for unexpected triumph out of obscurity. So when Ballet West decided to scrap one British ballet choreographer&apos;s "Cinderella" for another British ballet choreographer&apos;s "Cinderella," it prompted the question: What&apos;s the difference? Could Sir Frederick Ashton&apos;s version be any better than the dependable crowd-pleaser by Ben Stevenson, last performed by Ballet West in 2010? Both were choreographed to the Soviet-style Prokofiev score. Both cast male cross-dressers as the ugly stepsisters. And both choreograph the ballet for large casts. Evidently, the devil must be in the details. "There is so much specificity in Ashton&apos;s version," said Adam Sklute, Ballet West artistic director. "For example, we&apos;ve had to tone down the stepsisters because the comedy in this version is farce rather than slapstick. The stepsisters are the second most important roles in the ballet, and are highly choreographed so the humor doesn&apos;t get lost in some wacky business." In a rehearsal last week, the Ballet West studio at Capitol Theatre was steaming with sweaty dancers, guest teachers, artistic staff and the ubiquitous BBC camera crew, in town to film the second season of the CW reality show "Breaking Pointe." The BBC had painted the walls blue so the cameras had a background, while the young dancers/apprentices in white leotards were lining the room in rapt attention. As if on cue, dancer Beau Pearson, who plays one of the stepsisters, rushed over to Sklute whispering a question about his comic delivery. "Use the steps to create the character," Sklute advised. "Otherwise, it gets lost in your attempt to devise a character. It&apos;s a character, not a caricature." First soloist Arolyn Williams, one of three dancers performing the lead role of Cinderella, supports that philosophy. "Cinderella&apos;s character has to be revealed through the movement," Williams said. "You can&apos;t layer it on. She is downtrodden because of her situation, but she has some spirit. She is inherently sweet but she is also feisty  a survivor." Principal dancer Catherine Lawrence will also be performing the lead role. Unlike other classic roles, such as Juliet in "Romeo and Juliet" or Odette/Odile in "Swan Lake," there isn&apos;t a moment in "Cinderella" in which the dancer has to project a major change in the character. "Cinderella is kind of already grown up, she is in a situation where she was forced to grow up at a young age," Lawrence said. "So for her, she is allowed to simply become who she really is at the ball." Principal dancer Christiana Bennett is the third Cinderella. "I find Ben Stevenson&apos;s &apos;Cinderella&apos; character to be much more empathetic, more outwardly emotional," Bennett said. "I feel more sympathy for her character in Ben&apos;s version. Ashton&apos;s version has a more subdued portrayal of Cinderella. More understated." The story is so familiar that for audiences to find it fresh and interesting, Williams said, the dancer must make the character three-dimensional. At Ballet West to help the company learn the ballet are Malin Thoors and Wendy Ellis Somes, who work together to stage Ashton&apos;s "Cinderella," which was choreographed in 1948, around the world. Somes was a principal with The Royal Ballet, along with her husband, Michael Somes, a danseur noble and later assistant director of The Royal Ballet. Until her husband&apos;s death in 1994, the couple staged and produced Ashton&apos;s "Symphonic Variations" and "Cinderella," of which Somes is now the owner and custodian. 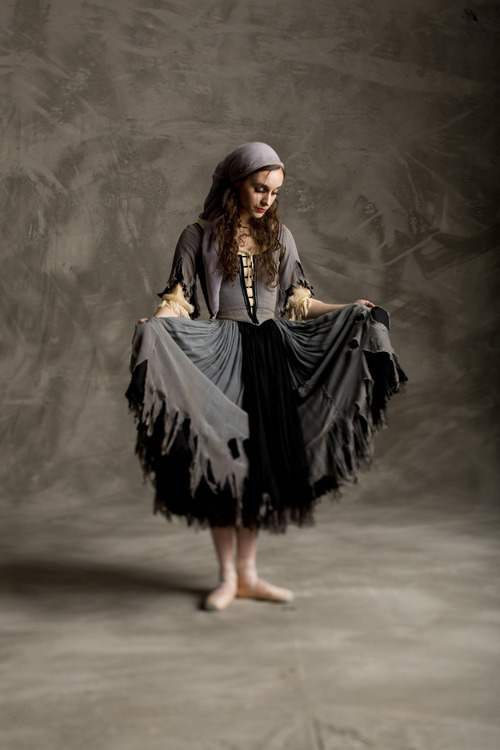 She and the ballet are regarded as an important link in passing down the Ashton tradition. Thoors danced in the The Royal Swedish Ballet until she retired in 1984, when she began to freelance. In addition to staging Ashton&apos;s work, Malin has been an assistant ballet mistress at the Paris Opera Ballet since 2003. "American dancers need to get the port de bras  a special way of using the arms  it&apos;s a different shape," Thoors said. "They&apos;re used to Balanchine, so they are a little freer in their arms, and that is something we are going to work on." Somes adds that Ballet West dancers are very quick to pick things up, which she says is important since mounting new works is very expensive. "Fred was very funny and possessive of his ballets  but we told him: &apos;If you don&apos;t let someone do it, it won&apos;t get seen,&apos; " Somes said. "We said, &apos;Fred, how often will the Royal Ballet go to America?&apos; "
According to Sklute, Ashton&apos;s "Cinderella" is making a comeback in America. Although Ballet West is only the second American company to perform the ballet (the other is Sklute&apos;s former company, the Joffrey), there are several high-profile companies waiting in the wings to produce the show next season. Ballet West presents Frederick Ashton&apos;s "Cinderella," with production directed and supervised by Wendy Ellis Somes and staged by Malin Thoors. Set and costume design by David Walker, with lighting design by Nicholas Cavallaro. The score, by Sergei Prokofiev, will be led by guest conductor Adam Flatt. When • Feb. 14-17, 20-23, 7:30 p.m.; with 2 p.m. matinees on Feb. 16 and 23. Tickets • $19-$75, at 801-355-2787, arttix.org or Capitol Theatre box office.